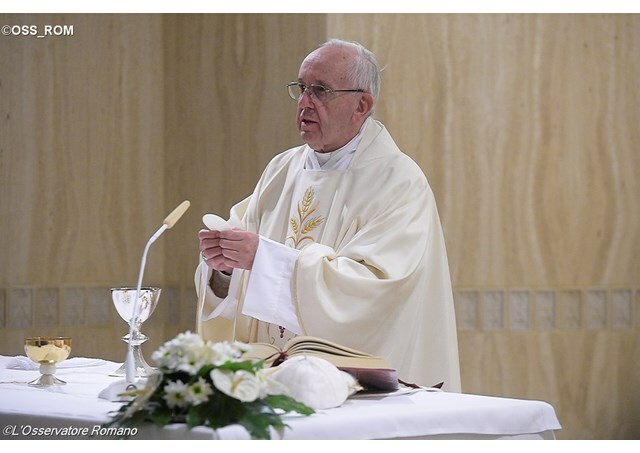 In his homily at Mass in the Casa Santa Marta on Monday, Pope Francis says Christians need to be generous towards the poor, and warns against the “disease of consumerism”. Pope Francis invited Christians to be generous towards the poor, saying a charitable attitude opens the heart and helps us to be kinder. He also warned that the enemy of generosity is consumerism, where we buy more than we need. The Holy Father said there are many places in the Gospels in which Jesus contrasts the rich and the poor. He said we can think of Jesus’ comment to the rich young man: “It will be hard for one who is rich to enter the kingdom of heaven” (Mt 19:23). Pope Francis said some would call Christ “a communist”. “The Lord, when he said these things, knew that behind riches there always lurks the evil spirit: the spirit of the world,” he said. But, the Pope noted, Jesus also said: “No one can serve two masters” (Mt 6:24). In the day’s Gospel (Lk 21:1-4), the wealthy “who were putting their offerings in the treasury” are contrasted with the poor widow “who put in two small coins”. Turning to statistics about the amount of poverty in today’s world, Pope Francis said the many children who die of hunger or lack medicine are an invitation to ask ourselves: “But how can I resolve this situation?” This question, he said, comes from the desire to do good. Pope Francis then told a story about a lady he met who, when she went grocery shopping, spent 10% on buying food for the poor. He said she gave her “tithe” to the poor. Pope Francis said consumerism consists in always buying things. He recalled that, when he lived in Buenos Aires, “every weekend there was a TV show about retail-tourism”. They would hop on an airplane on Friday evening, fly to a country about 10 hours away, and then spend all Saturday shopping before returning home on Sunday. Pope Francis said we need to have a magnanimous heart, where all can enter. “Those wealthy people who gave money were good; that elderly lady was a saint,” the Pope said.